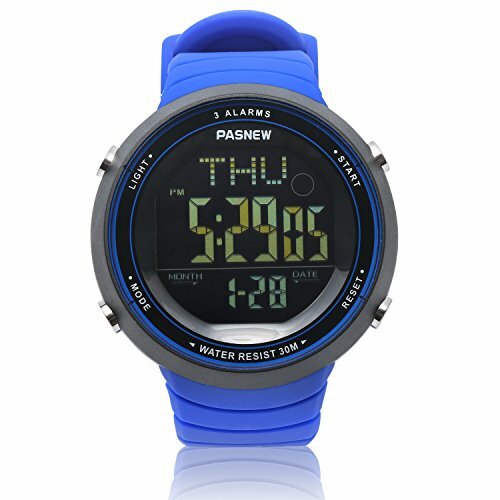 The ultimate teens sport watch! This waterproof watch with digital display has a durable PU band, stainless steel back and EL backlight for the night. It is lightweight and very comfortable to wear. It provides maximum precision time keeping with Japanese high accuracy quartz movement. The ensured longevity of the battery can last up to 3 years; there is no need to replace it sooner. The alarm function will notify you whenever needed; you just need to set it up according to your program. The stopwatch operation will show who is faster in any speed competitive game. Children love racing games and of course everyone wants to be first. This watch has a trendy athletic design and there is also a variety of colors, choose the one you thing is better and offer it as a gift. It will be the best gift ever! It fits perfectly on children near puberty ages but there are 10 regulation holes in order to be adjustable and comfortable. The watch will be received in a small paper box with the actual metal watch case and the user manual. This awesome waterproof sport watch is backed with one year quality guarantee. Don't Waste Any Time, Place Your Order For The HOWOD Teenagers Sport Watch While Supplies Last. Purchase NOW! DURABLE & HIGH QUALITY MATERIALS: HOWOD's teens sport watch is manufactured with environmental friendly, high quality materials. It has a stainless steel back and buckle, plus a soft PU strap that ensures comfortable adjustment on a teenager's wrist with 10 regulation holes and perimeter from 6.8 to 9.3 inches. This is a digital movement watch, 30m water resistant and has a long lasting battery. MULTI-FUNCTIONAL DEVICE: This amazing kids watch offers plenty & extremely useful functions. It is digital display that indicates hours, minutes, seconds, weekday, and date. The practical EL Backlight will assist considerably at night without disturbing children's eyes. There is also the alarm operation that can help to coordinate a busy day schedule besides the wakeup call. You can set 3 alarms once. FANTASTIC TEENAGER GIFT: You can choose the color that suits you better and be assured that this awesome trendy sport looking digital watch will be loved from any family member or friend. The watch comes packaged in a nice circular metal tin¡­the perfect gift! ACCURATE FUNCTION & TIME KEEPING: The best technology is applied for the perfect function of this watch. The precise Japanese quartz provides the most accurate time keeping. A reliable multi-functional watch that will keep you on time for many years. Time is really important, if you don't want to miss anything. RISK FREE PURCHASE WITHOUT HESITATIONS: We, at HOWOD, acknowledge your satisfaction, as our top priority. This is why we are offering only high quality products, made of the best materials, as our waterproof sport wrist watch that is backed with one year quality guarantee. So if any defect occurs, assuming normal use and without any damage caused by human factor, just contact us for an instant refund or a free replacement. If you have any questions about this product by HOWOD, contact us by completing and submitting the form below. If you are looking for a specif part number, please include it with your message.